Apple’s AirPods are now available at Apple Store for $159.00. Users can now order the Bluetooth-enabled headphones, which comes with up to 5 hours of music playback and high-quality sound through a “seamless and automatic connection” between the AirPods and an iPhone. The AirPods travel case also acts as a charging station that provides up to 24 hours of battery life for the headphones. Apple wireless headset is powered by new W1 chip, which allows for seamless connection with devices in Apple’s ecosystem so that they connect instantly whenever the rechargeable battery case is flipped open near an iOS device. The AirPods also monitor your listening and will pause music when they’re taken out of an ear. Playback controls done through Siri voice commands, which are brought up by double-tapping on the buds. The wireless headset comes with a Lightning cable to charge carrying case, and the headphones require Apple devices running iOS 10, watchOS 3 or macOS Sierra. 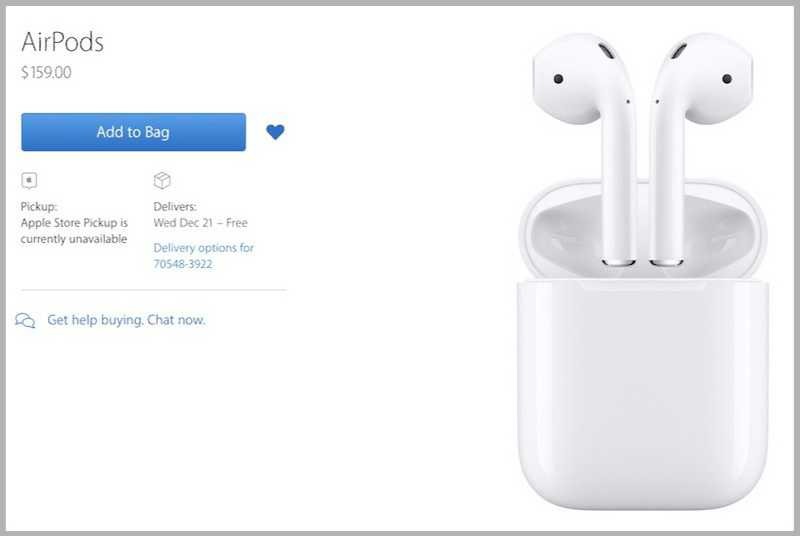 You can buy AirPods at Apple.com for $159.00 and expected deliveries are currently December 21 in the United States.